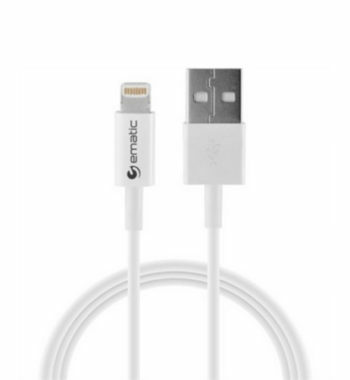 With the Ematic 10-Foot Lightning Cable for Apple iPhone/iPad/iPod, you can easily sync and charge your device from anywhere. Very user-friendly in usability, it features one end that plugs directly into USB bases and another end that plugs directly into your device. 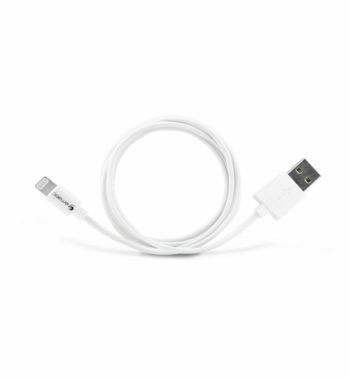 This Apple lightning cable is designed to accommodate newer model Apple products, including Apple iPhone 5, iPhone 6 and 6 Plus, iPod Touch (5th generation), iPod Nano (7th generation), iPad Air, and iPad Mini. With a flush-fitting design, this lightning cable fits securely into your USB port, allowing for maximum data transfer speeds and quick-charging capabilities. You will appreciate the convenient 10-foot cord length that allows you to easily reach over and around tables, counters, couches, and more. No need to worry about excessive use causing wear. The pliable protective sheathing gives you the durability required to keep this cable going for a long time to come.